Nithu's Kitchen : Tell us about you. Champa : I am from Mysore, Karnataka. Was born and raised there till I got married and moved to United States 11 years back. I have an undergraduate degree in Electrical and Electronics engineering and a masters (did it here in U.S) in Software Engineering. I work as a programmer. I have two little girls and quite a few hobbies. Nithu's Kitchen : What are your hobbies? Champa : I love singing. I am not trained in any music, but can sing just by listening pretty well. It can be movie songs or carnatic classical. Even though I love to listen to Hindusthani, I have never attempted to sing. I love shopping and can spend hours together in any store .. even grocery stores.When I have free time, I love watching food network (obvious, isn't it?) and comedies, mystery movies. Nithu's Kitchen : You are really talented and very happy to hear you sing well without any formal training. Which song you sing often? Champa : Most of the famous M.S Subbulakshmi songs and I sing some of the Richa sharma songs and some Kailash Kher songs from his album. To be precise, I like Srimannarayana, Shree Lakshmi Varaham of Subbulakshmi, Maahi ve, Maula mere maula of Richa Sharma, Teri deewani of Kailash Kher. Sorry, the list is pretty long. Nithu's Kitchen : You said you love to watch movies too. Tell us some of your favourite movies. Champa : I don't like movies that are violent. My favorite movie is I would probably say 'You've got Mail' and next favorite could be 'Miss Congeniality'. I loved 'Three Idiots' even though the ending could've been a little different. Nithu's Kitchen : Thanks for sharing about your interests Champa. When did you start to cook? Champa : I am the youngest of four and we had my mother's aunt living with us. So, I was not really introduced to the kitchen until my oldest sister got married and moved away. I was 16 at that time. I then started helping my mom when she cooked and just by observing, cooking came very naturally to me. I never had to put an effort in learning the concept or science of cooking. Nithu's Kitchen : Great to hear you started to cook at the age of 16. Can you share us a mishap from your kitchen? Champa : I am very organized and have had no accidents in the kitchen. But once I had come from India and I usually bring murukku and Mucchore maavu (powder) from India and when it gets spent, I make my own here. I had kept them in the freezer and for gokulashtami, I started making them. It was in the night and I couldn't tell the difference between the two because of yellow light in my kitchen. I couldn't taste since it was for God. I tried smelling and just made the dough and fried. I had used murukku maavu for Mucchore (Squeezed with 3 star disc and made with green gram dal and not urad dal) and mucchore maavu for murukku. It was hilarious when we tasted it. Nithu's Kitchen : That is quite an interesting incident. Who is your best critic? your husband or kids? Nithu's Kitchen : Yes Champa, I do agree with you. One could bring out best of oneself only when he/she is the own critic! What inspired you to start a blog? Champa : I had started leaving comments in Vaishali's Holy Cow Blog. Then I started corresponding with her giving her ideas and once she asked me to write a guest post on her blog. It never was done, but she was the one who suggested me to start blogging since I had so many ideas about food. Plus, I was tired of giving people recipes over phone and email repeatedly. Nithu's Kitchen : Good she gave the idea. Otherwise, we would have missed all your lovely recipes.Why is this special interest in baking? Champa : When I came to this country, since I had never seen an oven, got intrigued by it and started trying different things.At first, (10 years back) I tried everything without eggs and some of the recipes didn't turn out the way I wanted. So, stopped baking anything that had eggs in them. Switched to breads and buns and that kind of stuff. Now, I do bake with eggs even though I do not eat them. But, after so many years of experience, I can come up with eggless versions of most of the things now. Nithu's Kitchen : Did you take any special course on cake making? 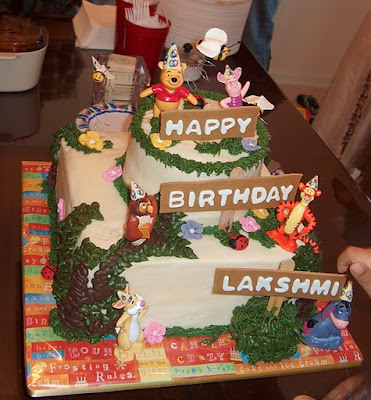 Champa : I took cake decorating classes 2 years back just so I can make my kids' birthday cakes. It became another hobby. I have made cakes for friends' kids, relatives and even colleagues birthday. Nithu's Kitchen : Can you share us the picture of cake/cakes you prepared for your kids/friend's kids? Champa : Sure. Most of the cake pictures are on my picasa web album. You can see how horrible my first cake was and how slowly it is getting better. I am not an expert, but I don't get to practice much to make myself better.I'l share you one cake picture which I made for my younger one's Birthday. Other pictures you can see here. Some of the cake pictures are not in the album. I don't have the pictures for them. Nithu's Kitchen : Wow! The cake picture is too beautiful. Thank you so much. What is your family's favourite food? Champa : Anything that is vegetarian and Indian, we love it. My husband is not very interested in trying out different cuisines. Nithu's Kitchen : What do you have today to share with us? 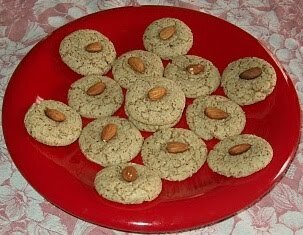 Champa : I would love to share my 'Vegan Almond Cookies' with all of you. 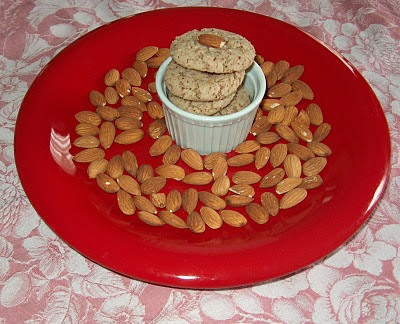 Nithu's Kitchen : Any special reason for selecting "Vegan Almond Cookies"? Champa : It is with this that I came up with the idea of replacing butter (fat) with nut butter (healthy fat) to make a very unique and yummy cookie. Little milk/ soy milk / water to mix the dough. Preheat the oven to 350 F. Line two baking sheets with parchment paper or use silpat mat. Mix almond butter and sugar thoroughly. You can use the electric beater, but since almond butter doesn't have water content, it is easier to mix by hand. Mix the flour, almond powder, cardamom powder, baking powder in another bowl and stir to combine. Add this mixture to the almond butter, sugar mixture and mix with hand. Sprinkle water a tsp by tsp to get the cookie dough consistency. It won't be a very smooth dough, it will be a little crumbly so don't put too much of liquid. Make key lime size rounds from the dough and flatten it and place on the cookie sheet. It will not spread, so if you don't flatten it, you'll get an almond ball. I got 32 medium size cookies for the above measurements. Bake for 12 - 14 minutes or till the bottom of the cookie has golden brown color. If you touch the cookie when it is still hot, it'll be soft. They get harder as they cool down. This is a chewy almond cookie with tons of almond flavor and not very sweet. Next time I probably will add some almond extract to even enhance the flavor. All in all, I will definitely be making these again and again. I had no time to place an almond decoratively, but if you do that, it will look even prettier. Nithu's Kitchen : Thank You so much Champa. Dear Friends, Hope you all loved to read about Champa and her wonderful recipe. If you are interested to be featured as Guest in this blog, please do mail to Nithuskitchen@gmail.com. Breath-taking shot of the cake.Looks divine! The Vegan Cookie looks like a healthy snack option! Thanks so much for such a nice write up. Nice to know more abt champa. Lovely recipe. Shared some awards with you nitu, do collect it from by blog. You are such a multi-talented lady, Champa..and what an awesome cake!! Love the recipe for almond cookies..Wonderful post, Nithu..
that was one lovely post Nithu and Champa! It's nice to know about one's experience in the kitchen! Oh, poor thing.., mixing and confusing, its all in the game of cooking! I always make sure to write down what mavu, just before packing in India, just to avoid the confusion! Anyway terrific cake decoration and lovely recipe Champa! Glad to know more about Champa, a wonderful baker, enjoyed reading..Cute cake and scrumptious cookies..
Nice to know abt champa. Wonderful cake & lovely cookies. Awesome. Thank you so much Nithu for a wonderful guest that I visit very often. Wow the cake looks gorgeous..Great knowing Champa..
Hey nice to know abt champa.. nice interview... the cake look gorgeous. Hi Nithu, good write up dear and Champa, the cake looks awesome and so do the cookies. Nice to know so many things about Champa... cute cake! !